I come to you today with a bit of an announcement…..though nothing has actually changed yet, so it’s more of an announcement of things to come (not of things that have already transpired). I’m sure it’s pretty evident that I’ve been overwhelmed with work lately. I haven’t been able to blog nearly as frequently as I’d like; I’ve sometimes written reactionary/overwhelmed posts (like this one); you all know the vast amount of time that it takes to deal with my Dad’s stuff; finding “balance” has been a reoccurring theme in my blog posts, etc. etc. etc. It’s something I’ve been talking about with hubs quite a bit over the past several months (I just want to note that this is not another reactionary thing – it’s been on our minds for a long time). So here’s the deal….I want hubs to quit his job. Hubs is a flooring contractor. He has a couple of crews of people who work for him but he, himself, also goes out and installs floors all day every day. He’s quite good at it and takes a great deal of pride in his workmanship. But for some reason, we have been unable to grow this business. He’s done it for nearly 7 years here in Tucson (with lots of experience prior to living here, both in Florida and Texas on high-end homes). But every time he starts to expand his operations, we’re hit with HUGE blows. Typically he has someone from an install crew make some mistake and he’s left having to cover the costs to rectify the situation. I think, at most, he was once hit with a $15,000 repair. But he’s had several jobs over the years that have cost him $5,000 here or there. I’ve gotten away from giving our monthly budgets (just due to time constraints as those are one of the most time-intensive posts to write), but when I reported our income monthly I’d sometimes talk about how he had a no-income month or a negative-income month. Yes, these things tend to even out (there are super high income months, too). But, on the whole, things just don’t seem to be progressing. We feel stagnant. And unable to gain traction. And aside from that, hubs isn’t getting any younger. Let’s face it – his job is manual labor. He’s going to need knee replacements at probably a very young age. His back aches daily and even now (at 34 years old), it takes him a couple minutes just to get up and start moving around some days. He has to stretch to make sure his knees don’t buckle beneath him. We’ve always known this job wouldn’t last forever. But we’d hoped he would transition away from doing physical install work and toward just managing at some point. Unfortunately, we’ve been trying to do this “transition” thing for nearly 4 years now and every time he gets close, he’s hit with these huge expenses and forced to go back to working, himself. It’s just not a sustainable business strategy long-term. (As a side-note, I want to mention that hubs was the sole income earner in our family for a very long time. I’m blessed beyond belief to have a work-horse as a husband! I’ve seen friends with lazy husbands who drag their feet applying for jobs or just basically refusing to work and in no way can I relate. Even when we first moved to Tucson and hubs had no official employment, he was buying and selling things on Craigslist and trying literally anything to make some extra money for our family. The man is one of the hardest workers I know). But when I’m literally talking about quitting my part-time job because I can’t keep up with it, yet it only takes me about 15 hours per week and is bringing in the same income as hubs’ 40 hour/week job…..it just doesn’t make sense for me to be the one to let my job go. When I first broached the subject with hubs, he was vehemently against it. Again – the man is a work-horse. He’s considered it and come to the conclusion that he would not be happy or personally fulfilled to be Mr. Mom. He wants to work. He yearns to work and provide for our family. But then we started considering some other options. Instead of quitting work and becoming Mr. Mom/Homemaker, what if hubs throws his time into securing a new career. We’ve looked into it and he can take college classes at the university where I’m employed for literally $25/class. Yes – twenty five dollars per class. So, what if he takes a few years “off” of work, during which time he helps out more around the house and with the kids to afford me the time to dedicate to work, and simultaneously goes back to school himself so he can change career trajectories??? Hubs has “some college”, but never finished an actual degree. One field we’ve talked about, specifically, is engineering. It doesn’t require a crazy amount of school (typically the four year degree is all that’s necessary), and you come out on the other end pretty employable (unlike many fields that require different advanced degrees just to be competitive on the job market). The big drawback to this is age. If we do this, he likely won’t be graduating until he’s 38 or 39 years old. Is that “too old” to make such a major switch in careers??? Like I said, nothing has happened yet. IF we do this (still a big “if”), we’ve talked about doing it as a slow transition. He would ramp down his business across the course of the next few months. He’d likely keep at least one crew working under his business license for the time being (he has one crew that is totally self-sufficient and does great work, so he could continue drawing a small income from the profits on their job). Then he’d look into some college courses for this coming Spring semester (starting in January). It’s just scary to make such a major life decision. It would obviously affect our debt payoff at least a bit, but the way things are operating currently are just not sustainable. I’m talking about having to quit my (very lucrative) part-time job, which would be a big blow to our income. Losing hubs’ income would also be a big blow, but when looking at it from a perspective of time versus money, it just makes more sense to keep my part-time job and give up his full-time one given that it’s basically the same amount of money either way. To test the waters, he’s already been ramping up his help around the house. He basically does 90% of the laundry at this point, 75% of the general cleaning, and significantly more childcare (he picks up and drops off at preschool much more regularly than he used to last academic year & always takes them somewhere once every weekend so I have a few hours of dedicated work-time on Saturday or Sunday). It’s just hard. There’s no guarantee on the other side that he’ll 100% for sure be able to go into this completely different career field. And we know that this can not be a long-term plan because, like I said, he would not find it to be a personally fulfilling lifestyle (which is very important, even though I’m sensitive to the fact that many would bend over backward to be in the position to quit their job and not have to worry about the financial implications). So I’m just kind of laying it out there for you. I’d love to hear if you have stories of mid-life major career changes (into a totally different field all together). Do you know any books on the topic that might be helpful to read as we consider this type of major life transition? Do you have any suggestions of things we might want to research or take into consideration? For the record, yes, it will have an impact on our budget and debt payments. But, as I’ve mentioned, that’s likely to happen anyway (since the alternative is that I quit my part-time job and at some point down the road we would still need to figure out an alternative plan for hubs because he cannot physically stay in his current career forever). In addition to constructive criticism, advice, and suggestions, I also welcome happy thoughts and prayers for clarity while we try to figure out what the best move is for our family in the coming years. 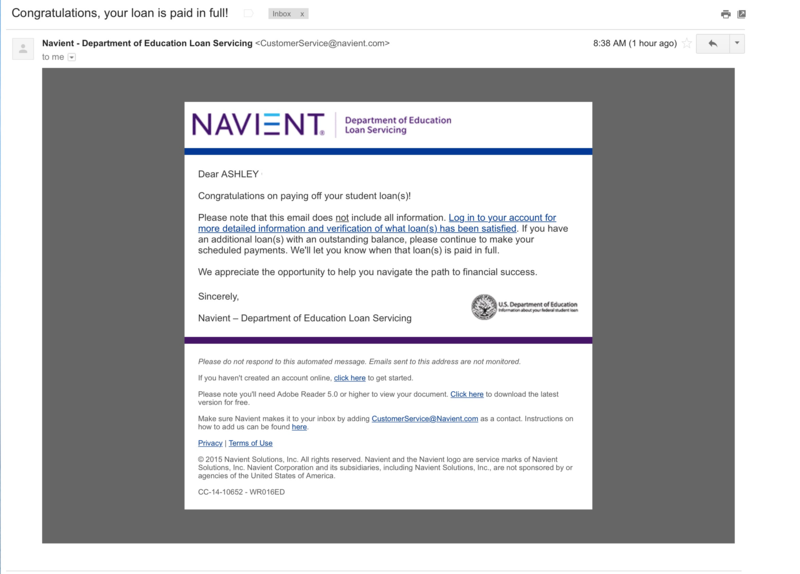 Sure doesn’t get old to see these “loan payoff” emails! I’m now officially down to 7 Navient loans (out of what 12). To be fair, I’d paid off this loan prior to last month’s debt update, but it took until the next billing cycle (now) for them to acknowledge that the loan was, indeed, paid in full. Anywho…..pretty exciting stuff! Still lots of big loans ahead, but it’s a nice little pat on the back, indeed! Lots (and lots!) going on in life right now! We’ve been house-hunting twice (no offers yet). We have lots of work/social functions (Last weekend was an “early faculty” happy hour. Tonight is a departmental social function). Next week we’re going back to Texas as a family. Originally hubs was going to go on his own (to spread his grandfather’s ashes with his mom), but it’s Labor Day and the kids have 2 days off of school anyway so we decided to just all go back together. I’m going to be doing various dad-related duties while in town, including: 1. going to social security office with him so I can get official permission to talk to them since they don’t recognize power of attorney, 2. meeting with a financial advisor to better invest my dad’s money, 3. meeting with a realtor to sell the Texas house. I’m a teeny bit bitter that a chunk of my trip is going to be monopolized with dad-related stuff when I have two siblings who live in the same city that are perfectly capable of doing the things I’ll be doing. But such is life. There are ebbs and flows. Sometimes my sister picks up more of the “dad slack” and sometimes it falls on me. It’s already a huge relief for his Utah property to be sold and, although we’d originally talked about renting the Texas house, no one has stepped up to take control and my #1 stipulation is that I don’t want to deal with it. Since the duties have fallen to me anyway, I’m going to handle it how I want….which is to get rid of the property so I don’t have to deal with it. We have other (more personal) reasons why we want to get rid of the property instead of renting it, too. Mainly that, due to my dad’s disease, he has a tendency to f*ck stuff up and I just have a gut feeling that if we were to try to keep and rent the property, he’d find a way to mess it up. Might just show up at the front door (illegally) and demand something of the tenants. Or might cause an altercation with the property management company. Who knows? To limit liabilities (and make my life easier), the place just has to go. So that’s what I’ll be doing the Friday before Labor Day (the only business day that I’ll be in town). Hoping I can get that drama out of the way and enjoy the rest of the long weekend doing low-key and cheap or free activities with the family. Do you usually travel for Labor Day? We typically don’t, but it’s just worked out that way this time. 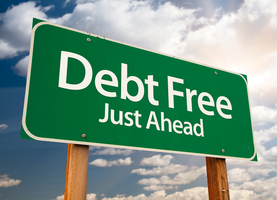 What’s the last debt you paid off in full? Every new Navient loan that I pay off feels like a major triumph. Sooooo over that company! I swear! Once our house situation is squared away I plan to refinance my student loans through another company so I can get a reduced interest rate (and just not have to deal with Navient anymore).